Miguel, writer of the torrid telenovela titled "Destiny of Love," is out joy riding and smoking pot with a few friends when he is pulled over by the cops. Things look dicey until Miguel reveals his occupation. It turns out that Bracho, the portly middle-aged cop, is a huge fan of the series. 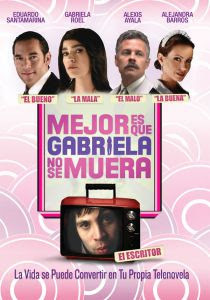 He begs Miguel for an inside scoop, and Miguel tells him that Gabriela, the show’s villain, will marry her lover. Bracho lets Miguel off the hook and quickly brags about the scoop to everyone he knows. Unfortunately, Ana Victoria, the actress who plays Gabriela, decides to quit the show and Miguel must write the character off the show by giving her a fatal disease. When the next episode reveals Gabriela's imminent demise, Bracho becomes the laughing stock of the police precinct. When he begins stalking Miguel, pressuring him to change the story line, matters quickly spin out of control and a hilarious sequence of events unfolds. ***Disclosure-I received a copy of the movie to review.